Skullee, Stickybuds, Funkanomics, Father Funk, Nick Thayer and more. Join Turtle on the decks with his trusty sidekick FRINGEofSTEEL every sunday lunchtime 1-3 for the best in hiphop, nufunk, party breaks, ghetto funk & Bass music all live in the mix. 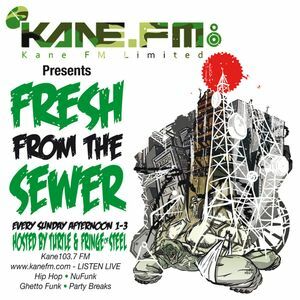 www.kanefm.com/mediaplayer - streaming worldwide - log on or jog on! This show was originally broadcast on Sunday 9th December 2012. Stay up to date with all the news and goings on, underground in the Sewer - add us!